Boards of a certain length and humans of a certain vintage took over the lodge this trip, and Huey approved by slinging through solid swell for these experienced chargers. Let’s meet our cast of guests. Randy Rarick needs no introduction. 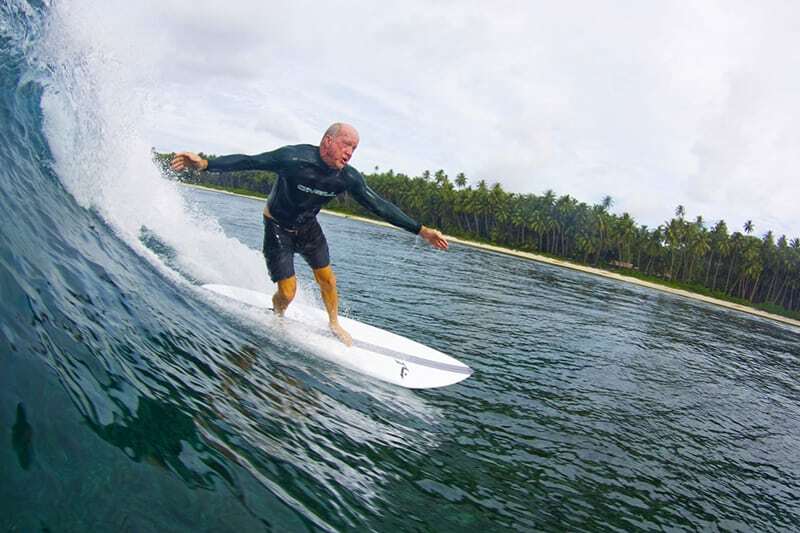 One of pro surfing’s legendary founding fathers. Randy loves taking off on bombs, a glass of iced wine of an evening, and his daily massage. This is Randy’s second trip to the lodge, and it’s been ace to surf with him again. Don Craig from California, is owner of the ‘Old Guys Rule’ brand, and true to that brand’s ethos, has been using amazing equipment to tame every lineup with style. Dr Patrick Rubsamen is an opthamologist from Florida. Pat’s been trying a mix of boards and developed a serious crush on Randy’s step up. Pat’s also been a handy first mate on the boats. Cary Glickstein – Mayor of Delray Beach Florida if you don’t mind – Cary’s been a standout at Maxing Max’s Right, and if anyone’s enjoyed relaxing away from the pressures of work, it’s been Cary! Michael Wright (No, not that Mikey Wright). Hailing from Hawaii, Mike’s been all over LeBa and Max’s Right. A smart selector of waves, Mike’s found the odd barrel at LeBa on his bright yellow board. Willy Asprey. The young fella of the trip! Willy hasn’t stopped surfing since he arrived. He’s literally been putting in eight hour days at Max’s Right. Kid doesn’t stop! Tim Denmark from California, Tim’s a weapon of a bloke for his age, and matched Willy for endurance and enthusiasm. Tim never says no to an extra session. Always positive. Captain Jim Manos is an airline pilot from California. Even though Jim’s had a few injuries (torn bicep this trip for starters) he’s still given it his all. Top fella. Max’s Right turned on for the first half of the trip – there’s nothing better than chilling at the lodge between sessions, watching the boys take it on, then thumbing a lift back out in the scotchy boat when your personal amp-o-meter can’t take it anymore. Max’s Left has had the odd session – but we’ve been selective around getting lineups to ourselves. Leba’s been great too. In general, the surf’s been consistently overhead the whole trip except for one quiet day. This bunch of elder statesmen has been charging! Quiet nights and early surfs everyday is the way! Cheers fellas, it was a blast.